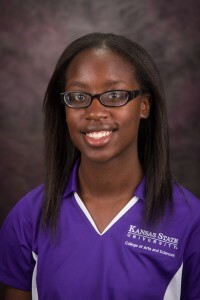 Shai Washington, senior in political science and international studies, was selected as one of 10 students nationally to receive a 2015 Thomas R. Pickering Undergraduate Foreign Affairs Fellowship with the U.S. State Department. The fellowship, administered by the Woodrow Wilson National Fellowship Foundation, provides financial support for a student’s senior year as an undergraduate and their first year of graduate school. In addition, students participate in one domestic internship and one overseas internship; receive mentoring from Foreign Service Officers in the U.S. State Department; and after completing a master’s degree, are expected to become Foreign Service Officers. “This has been my career goal since high school,” Washington said. “I’m excited to meet and get to know all the people who are involved in this program.” Washington, a first-generation college student, became interested in a career in foreign affairs when she spent a summer in Morocco after high school as part of the State Department’s National Security Language Initiative for Youth. “The Foreign Service is highly selective, and the Pickering Fellowship offers Shai an incredible opportunity to prepare for a career in international diplomacy,” said Jim Hohenbary, director of KSU’s Office of Nationally Competitive Scholarships. “I think she will represent K-State, Kansas and the United States very well in that role.” The fellowship program is named in honor of an American diplomat and career ambassador. Pickering (who is not, by the way, related to KSU’s department head) served as an ambassador to five different countries and finished his career in the Foreign Service as undersecretary of state for political affairs from 1997-2000. Shai is the president of the College of Arts & Sciences Ambassadors and secretary of K-State’s Model United Nations team. She is a member of the university’s Student Foundation, a McNair Scholar, a member of the Mortar Board Senior Honor Society and a member of the national political science honorary society Pi Sigma Alpha. In addition, Washington is a 2015 Public Policy and International Affairs Program fellow, which allows her to study at Princeton University this summer. Washington gives credit to many supportive faculty at KSU and in the political science department, noting especially Dr. Andrew Long (associate professor) who served as a mentor for her McNair Scholar project, and Dr. Carla Martinez Machain (assistant professor), who oversaw her senior thesis.